So apparently some mysterious barrels were found aging in the back of an old Stitzel Weller rick house. Diageo – parent company of Bulleit Bourbon – comes along and (eureka!) finds these barrels, bottles them, and puts out ‘limited releases’ of these old orphan barrels. Thus, the Orphan Barrel project is born. I grabbed a bottle (at $75) for this tasting, but before I got around to doing some research, I noticed some funky discrepancies. One of my primary reasons for running out to grab Barterhouse was it being touted as a limited release. To date, more than 60,000 bottles have hit bar and store shelves nation-wide. Could someone define limited release for me? For a comparison, last year’s Four Roses Limited Single Barrel Release was only 5,000 bottles. Where the hell was this stuff really made? The bourbon inside the orphan barrel was distilled for United Spirits (under Guinness) sometime before 1997. In 1997, Guinness and another company named Grand Metropolitan merged to create what we know today as Diageo. So these whiskey in Barterhouse came from the same parent, albeit a merged version of its previous company. 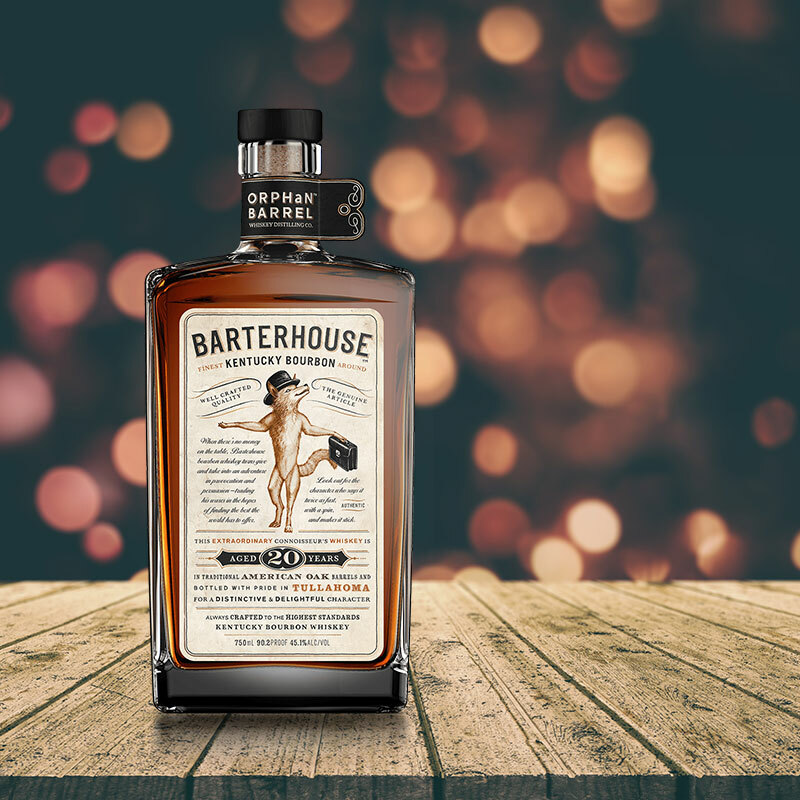 Orphan Barrel Whiskey infers this was distilled at Stitzel-Weller, but Barterhouse was actually distilled at the current Bernheim plant. The side of the bottle says something about Tennessee – apparently the bourbon was bottled at a special facility that Diageo owns close to Dickel. Then the front of the label says its Kentucky bourbon whiskey. So from our deduction, this stuff was made at United, aged at Stitzel-Weller, and bottled in Tennessee. Are you confused yet? I am. And that is the third demerit in our evaluation of Barterhouse Orphan Barrel Bourbon. Enough of the hype. Is this bourbon ‘mysterious’ enough to pay $20 a pour or $75 a bottle for? Lets find out! For me, a good bourbon tasting engages all the senses, and the color makes me feel a little better about Barterhouse. It has a rich brown hue that seems to absorb the light around it. You wouldn’t glow either if you had been (allegedly) sitting in a rick house for decades. I hold all first tastings in a glencairn glass, which may have not been the best of ideas. Despite the low proof (Barterhouse is only 90.2), the ethyl is enough to singe nose hairs. The nose reminds me of big red gum. There’s a sweet, cinammon like aroma that comes off the glencairn once you let the bourbon air. No complaints there. After a little more time, the expected aroma of old wood manifests – but not 20 year old wood. The predictable vanilla is there, as well as brown sugar. I can sniff Barterhouse all day. I wish I could say the same thing about the taste. The first sip has the personality of a cantankerous old man – rough, bitter, dry, and leathery. What have I done. What did I just buy? I taste the old wood now more precisely – an element hidden in the nose by the ethyl. The cinnamon is still there, but it is coupled with a bitter leather-like taste. The tannic dry drag on the back of my tongue is the best indicator that this really is a 20 year old that has been sitting in wood. The mash bill has something to do with the character of the bourbon: Barterhouse is made from an 86% Corn, 6% rye and 8% barley mash bill. The taste is not pleasant, but the finish is a redeeming quality. It lasts and mellows into potpourri and butter. Hyped up bourbon turns me off, building my expectation for something that doesn’t stand up to it. I can think of better bourbons to spend $75 on. I give Barterhouse a C.
Find out how we grade bourbons. You might have a different opinion, but I don’t think its worth the $20 a pour at my favorite bar, nor do I think I would buy another bottle. This bourbon has its following. I will stick with my EC12. If you enjoyed this article, keep the conversation going! Tell us what you think. Vote using the stars or leave a comment. I agreed with everything upto the rating. Baterhouse (at least the batches our bar recieved) was quite possibly one of the best American Whiskeys I’ve tried… Up there with Weller 12yr Antique (~140°), Rittenhouse 23yr, Parker’s Promise of Hope, and the elusive 17yr Jefferson’s Presidential. Not sure what happened with your bottle, but I wouldn’t put it past Diageo to have inconsistencies. My daily drink now that Buffalo Trace and Weller are nowhere to be found… Is Old Grand Dad 100° and 114°. If you’re into Elijah Craig, then do yourself a favor and track down a bottle of Ezra Brooks 12yr Single Barrel… Same juice, but slightly more refined. I love how much each barrel shows their unique differences when lined up next to another barrel. There’s something to be said about a well made, consistent small batch… But single barrels allow us with commitment issues to move along to the “next thing” without feeling like we’re cheating! I had higher expectations. I’ve had friends over trying it and they liked it, but for me…it wasn’t a winner.